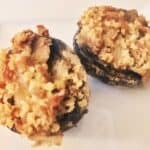 Vegan Sausage Stuffed Mushrooms are a hit at any party. Just remember to take one before they disappear. Add panic bread crumbles, and stir.